Million TIMES More Squalene In H1N1 Vax Than Caused GWI !! [2013 March] Swine Flu Vaccine Caused Narcolepsy in Thousands: BMJ Claim by Heidi Stevenson The narcolepsy toll from GlaxoSmithKline’s Pandemrix swine flu vaccine is far more rampant than already recognized with 800 European children’s lives devastated. The British Medical Journal (BMJ) has revealed that the numbers worldwide must run into the thousands. Suggestions that there was something unique about the Scandinavian population that first noted the problem have now been shown to be untrue. [2009 oct] Belgian doctors call for sack of government virologist in row over swine flu adjuvant advice The Belgian association of doctors has called for the government's interministerial commissioner for the flu, the virologist Marc Van Ranst, to be fired after he said on Thursday that the Pandemrix swine flu jab with the adjuvant squalene was safe for pregnant women. GSK admits in FEB 2009 that it planned on introducing squalene adjuvant ASO3 into regular season flu shots and aware of autoimmune issues! [2009 July] Squalene: The Swine Flu Vaccine’s Dirty Little Secret Exposed By Dr. Mercola A novel feature of the two H1N1 vaccines being developed by companies Novartis and GlaxoSmithKline is the addition of squalene-containing adjuvants to boost immunogenicity and dramatically reduce the amount of viral antigen needed. Rat models are useful for studies of the pathogenesis of rheumatoid arthritis (RA) since rats are extraordinarily sensitive to induction of arthritis with adjuvants. Injection of not only the classical complete Freund's adjuvant but also mineral oil without mycobacteria and pure adjuvants such as pristane and squalene, induce severe arthritis in many rat strains. Models like pristane-induced arthritis in rats are optimal models for RA since they fulfill the RA criteria including a chronic relapsing disease course. Arthritogenic adjuvants like pristane, avridine, squalene and mineral oil are not immunogenic since they do not contain major histocompatibility complex (MHC) binding peptides. Nevertheless, the diseases are MHC-associated and dependent on the activation of alphabetaTCR (T-cell receptor)-expressing T cells. However, it has not been possible to link the immune response to joint antigens or other endogenous components although immunization with various cartilage proteins induce arthritis but with different pathogeneses. To unravel the mechanisms behind adjuvant-induced arthritis, a disease-oriented genetic approach is optimal. Several loci that control onset of arthritis, severity and chronicity of the disease have been identified in genetic crosses and most of these have been confirmed in congenic strains. In addition, many of these loci are found in other autoimmune models in the rat as well as associated with arthritis in mice and humans. In science, a correlation does not prove causation. A correlation, however, is grounds to investigate causation, which has led to some troubling data. After the first Gulf War, many U.S. and British military personnel said they became sick after receiving anthrax immunizations. Scientists at Tulane University Medical School developed an assay showing a correlation between illness and antibodies to squalene. 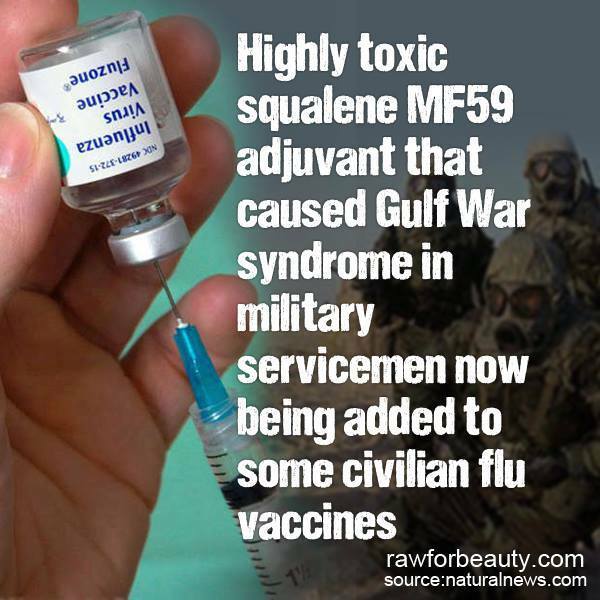 Although this data did not prove conclusively that Gulf War troops were injected with squalene, the data indicated that injection was the only way to develop these antibodies; the implication being that troops had been injected with a squalene-based adjuvant. This coincided with the fact that at the time, U.S. Army scientists had developed several new and theoretically improved anthrax vaccines that provided more immunity than the licensed vaccine; and did so in less time and with fewer shots. 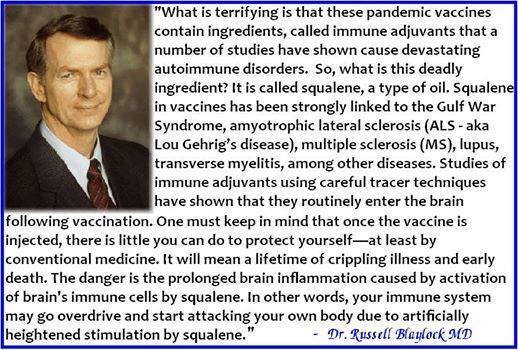 All these new anthrax vaccines contained squalene. I interviewed dozens of Gulf War veterans whose mysterious undiagnosable illnesses were later diagnosed by civilian physicians as autoimmune. Of the sick Gulf War veterans tested by Tulane's scientists, 95% had antibodies to squalene. Tulane's data showed another correlation, and this one concerned them even more. Veterans who never deployed to the Gulf had developed chronic and debilitating illnesses too - 100% of sick,non-deployed veterans tested by Tulane had anti-squalene antibodies. When Tulane tested healthy veterans, they found that 0% had the antibodies; that's zero percent. Formation of Cysts from Squalene Adjuvant? In 1998, active duty military personnel deploying to an AOR (Area of Responsibility), which included Saudi Arabia and South Korea, were injected with anthrax vaccine. Many personnel reported sickness after their immunizations, which were later determined by FDA testing to contain trace quantities of squalene. The Department of Defense and the FDA stated that these quantities were too small to harm anyone and that the nanogram quantities of squalene in the vaccine probably came from the eggs in which germs for vaccines are grown. There was a problem with this explanation. Viruses are grown in eggs; bacteria are not. Anthrax is a bacteria. Then the DOD and FDA suggested the squalene came from the bacteria itself. However, scientists had analyzed Bacillus anthracis and proven that it does not produce squalene. DOD then offered a third explanation: the oils in human skin contain squalene; someone's hands must've contaminated the vaccine. The problem with that explanation was that vaccine workers wear gloves and hats and booties. The other problem is that oil and water don't mix. 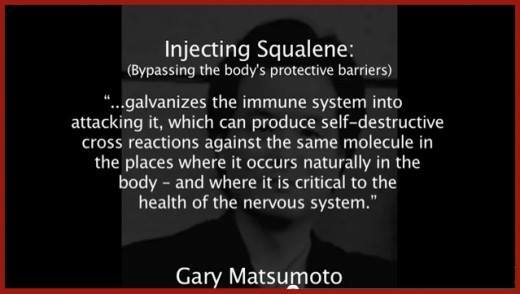 Nevertheless, trace quantities of squalene had been emulsified in millions of vaccine doses. It wasn't found smeared on the exterior of glass ware. It was in the vaccine. Special detergents must be added to an oil to break it down sufficiently to mix it with water. What DOD and the FDA left out of their explanations was this. In 1998, the DOD, FDA and NIH formed a Special Working Group to accelerate the development of the Army's new anthrax vaccine containing squalene. Also that year, NIH scientists published data, which indicated, they said, that animals can become "tolerized" to squalene with micro-dosages. Coincidentally, nanogram doses of squalene, parts per billion, appeared in the military's anthrax vaccine supply that same year, in 1998. Formation of Cysts from Squalene Adjuvant? Military personnel injected with anthrax vaccine containing squalene have been reporting that they developed cysts, appearing all over their bodies. Among the first to report this were Air Force personnel at Dover Air Force Based in Delaware, which had received at least four lots of anthrax vaccine containing squalene. One fellow developed cysts all over his body, including his pericardium. Another fellow developed them on his spinal cord. These cysts were similar to those in British civilians injected with the flu vaccine containing mineral oil, because they were "sterile" - they were not associated with viral or bacterial infection. Formation of Cysts from Squalene Adjuvant? Department of Defense and Health and Human Services regulations permit the administration of experimental drugs and vaccines to U.S. military personnel without informed consent. In contravention of the principles memorialized in the Nuremberg Code, the administration of Invesigational New Drugs (INDs) can be done covertly, in clinical trials that are classified. This is stated in unclassified documents issued by the Department of Defense and Department of Health and Human Services. Formation of Cysts from Squalene Adjuvant? Since the early 1950s, U.S. military scientists - working in cooperation with scientists with the NIH, FDA, and U.S. Public Health Service - have been testing cyst-producing oil-based vaccine adjuvants on U.S. military personnel. Formation of Cysts from Squalene Adjuvant?